Four years ago we embarked on what is still the best trip of our lives. 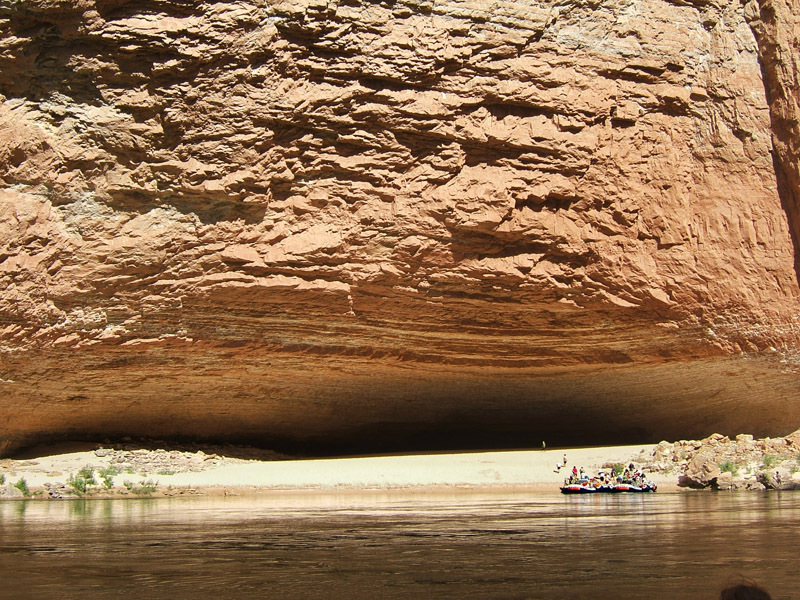 In what we now clearly recognize as a prelude to our current travels, in July 2008 we set out for a seven-day, six-night Grand Canyon rafting excursion. Before that trip, we had never pitched a tent under the stars; never rafted; and certainly never experienced whitewater of any kind. Yet there we were, flying off to confront some of the biggest whitewater in the country, on a trip that once started had to be seen through to its end. The only way out of the Canyon for us would be by medical helicopter. That assumed we made it into the canyon in the first place. We almost didn’t. In a foolish attempt to conserve vacation days we scheduled our arrival so tightly that a canceled flight almost cost us the entire trip. Waiting in line at Newark Airport for an alternate flight, we knew that if we didn’t get to our departure point in Flagstaff, AZ, by 5:30 AM the next morning, our boat would leave without us. The good news: we got on another plane almost immediately. The bad news: that plane flew not west to Flagstaff but south to Washington, D.C. From there we hoped to catch a flight to Phoenix and from there, the last flight of the day into Flagstaff. We had one canceled flight behind us and two connections in front, with very little room in between. Everything had to go perfectly with each of our next three flights. No cancelations. No delays. No lost bags. No nothing. We weren’t feeling terribly optimistic. We landed at Dulles International Airport only slightly delayed and with only a partial sigh of relief. Feeling a bit like contestants on the Amazing Race we began forming contingency plans. From Dulles, we thought we had a good shot at getting into Phoenix but maybe not in time to make our connection. Without the aid of a smart-phone (this all happened a technological lifetime ago) we went old school and dialed 411. We tried airport car rental agencies first and then bus lines. The latest option we could find was a midnight Greyhound bus that got into Flagstaff at 3:00 AM. That was our drop dead time. If we could get to the Greyhound terminal by 12:00 AM, we’d raft the Colorado. If not, we’d have a week to kill in Phoenix. We arrived at our Flagstaff hotel long after our appointed safety briefing but still with enough time to catch a couple hours of sleep and, most importantly of all, to get on our raft in the morning. Whitewater, here we come – for better or for worse. I have to admit, the first hour or two meandering down placid water had me worried. This was the first of seven days on the river. From here on out, we’d have no T.V., no cell phones, no newspapers or any contact with the outside world to entertain us, just floating, floating, floating. I thought I might get bored. Our trip leader, Brandon, set the tone early for the entire outing. His oft repeated slogan, “Go big or go home” originally referred to how he planned to take the rapids. Instead of charting the easiest possible path, he’d take them “Big” and head right into the roughest water. The slogan soon became the motto of our entire time in the Canyon – and perhaps our life, thereafter. We found the extreme desert conditions to be an even greater challenge than the rapids, though. July heat that routinely reached 110 degrees Fahrenheit on the Canyon floor was only half the story. The freezing cold Colorado River was the other half. Chilled beneath several thermal layers behind the 700 foot tall Glen Canyon Dam, the water released into that portion of the Colorado is icy cold. Even in early July, the water temperature was only in the low 40’s. In those first few hours, Brandon challenged us to “take a bucket” of that frigid water over our heads; something we’d need to do routinely in the coming days not only to battle the scorching heat, but also if we wanted to bathe. He had a pacifier necklace to wear for anyone who demurred or cried out in shock. To her credit, Shannon volunteered first and took a bucket with a stiff upper lip. No pacifier for her! “Go big or go home” and “get the pacifier” were refrains that bookended our rugged adventure through the canyon. Proving himself to be eminently fair, Brandon even gave himself the pacifier on the third day of our trip for reasons known only to a few of us and the Canyon. But not all was hardship. We ate surprisingly well for being so far removed from civilization. In fact, it was the first time we’d ever heard the word “snack” used as a verb. And at Brandon’s direction, we were “snacked” early and often to make sure we kept our energy levels up. In addition to all the snacking, the prepared meals were out of this world. Breakfast, lunch and dinner were different and fabulous every day. From prime rib to camp-kettle brownies, fresh fruit to halibut steak, we ate like kings in one of the most beautiful places on earth. Amazing photos can’t wait to read more. What a beautiful place! It makes me feel so small in comparison. Something like the Grand Canyon really does make you feel small. It’s a good reminder of our place in the universe and not to take ourselves so seriously. Whew! After all that, I’d need a vacation. 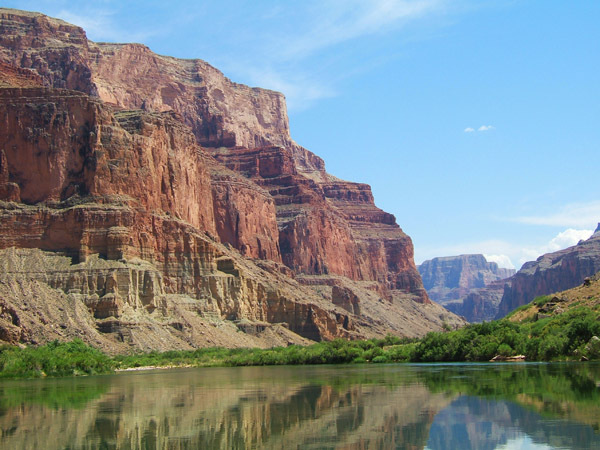 We’ve been to the Grand Canyon – flew over and landed at a spot where we had lunch – but, I don’t think I’d have the courage to tackle Grand Canyon rafting. Although your excellent descriptions make me wish I had. Rafting the Colorado was one of the highlights of my life. And the food is a spectacular as the scenery and rapids. I’m glad you’re liking it. I didn’t originally intend for it to be a cliff hanger, it just got a bit long for a blog post so I figured it’d be better to do it in two parts. Thanks for taking us on this trip of a lifetime…Looking forward to the next chapter! WOW! Double pleasure of being to a famous magnificent site and having a raft experience all over it. Whattaway to ‘travel’. Thanks for stopping by. Glad you like our blog. Haven’t done the Grand Canyon rafting thing in many years. Cool that you’re writing about it. I love reading this stuff! It was four years ago for us too. It’s something we think we’ll do again. But next time, we want to pack the boat with friends. Did you happen to go out on the glass extension that they’ve built up on one of the ridges? I’ve not done that, either, but it sounds like a great photo op. Haven’t been on the glass extention yet. They built that on the West Rim, which is pretty far from where we were. I think it is closer to Los Vegas than Flagstaff. 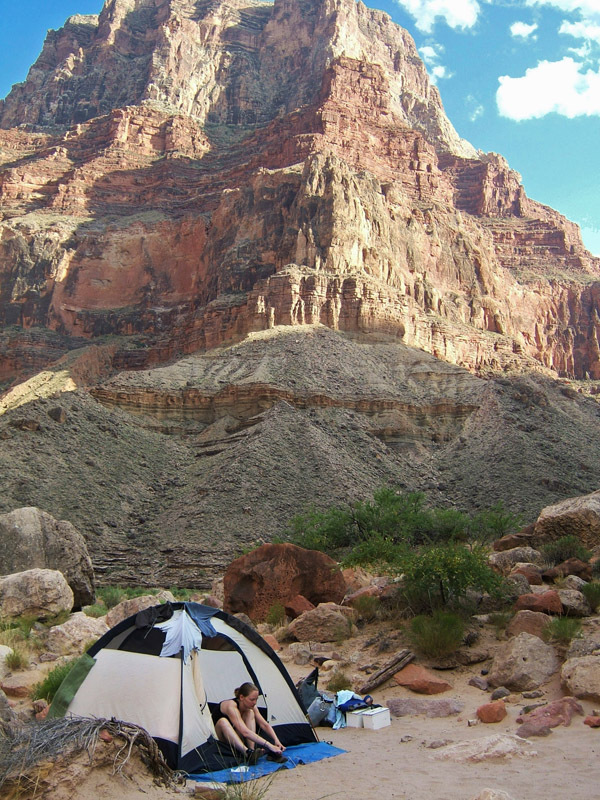 Amazing pictures, the Grand Canyon sounds like quite the adventure. Fun! The Canyon is wonderful however you see it. Wonderful post. I haven’t been there for years, but the Grand Canyon never disappoints! wow fantastic!! I’ve visited Grand Canyon a couple times before but never been down the mesa. this is great! love your blog!! Still our favorite trip. Thanks for stopping by and commenting. Just awesome! props to you guys and your blog! What amazing photographs! I’ve always wanted to go to this beautiful place in the world and have yet to make it there!! I did this with my husband and kids ten years ago. Great experience. Lolz…..the title grabbed my attention …. you mention tho that the only way out of the Canyon would be by heli medvac’d but it all ended well! was it bc you were nervous? i was left under sheer suspense bc i thought something awful was going to happen. Thank G-d you all fared well. It was just hard for me to read bc i misinterpreted the ominous sentence at the beginning. I think the body surfing with a ‘body board’ would have been cool, but obviously not ideal to hike with. I’d have died on that 5 mile 3 rapids, crystal 10 thing in the later episode Part II. That or i’d have lost a lung or my head screaming. Especially if i noticed the leaders of the team stopped joking and got real serious. Years back i used to be real hung-ho fearless (maybe bc i had not come to terms with dying and pain) i’d have done this fo’ sho! Those pix of your trip are AWESOME! I felt like i was there the way you describe it so well! Awesome! you know exactly what I meant!